The Association for Mindfulness in Education is a collaborative association of organizations and individuals working together to provide support for mindfulness training as a component of K-12 education. As such, mindfulness is a foundation for education; mindfulness provides the optimal conditions for learning and teaching and also supports all pedagogical approaches. Over the past decade, training in mindfulness—the intentional cultivation of moment-by-moment non-judgmental focused attention and awareness—has spread from its initial western applications in medicine to other fields, including education. 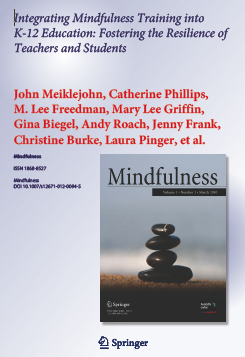 This paper reviews research and curricula pertaining to the integration of mindfulness training into K-12 education, both indirectly by training teachers and through direct teaching of students. Research on the neurobiology of mindfulness in adults suggests that sustained mindfulness practice can enhance attentional and emotional self-regulation and promote flexibility, pointing toward significant potential benefits for both teachers and students. Early research results on three illustrative mindfulness-based teacher training initiatives suggest that personal training in mindfulness skills can increase teachers’ sense of well-being and teaching self-efficacy, as well as their ability to manage classroom behavior and establish and maintain supportive relationships with students. Since 2005, 14 studies of programs that directly train students in mindfulness have collectively demonstrated a range of cognitive, social, and psychological benefits to both elementary (six studies) and high school (eight studies) students. These include improvements in working memory, attention, academic skills, social skills, emotional regulation, and self-esteem, as well as self-reported improvements in mood and decreases in anxiety, stress, and fatigue. The educational goals, target population, and core features of ten established mindfulness-based curricula are described. Finally, the need for more rigorous scientific evidence of the benefits of mindfulness-based interventions in K-12 education is discussed, along with suggestions of specific process, outcome, and research-design questions remaining to be answered. To stay up to date with the latest mindfulness research, visit AMRA. Add your school, university, or organization to the map. Visit the AME List serve. Not already a member? Sign up today.